Earlier this week Exact Editions release through the Apple iTunes App store a branded magazine App for the UK’s leading sporting periodical Athletics Weekly. If you have an iPhone and work in the magazine business you really need to treat yourself to a short subscription to this publication. Direct link. Even more important than the readability of the magazine text, is the new shape and potential for digital browsing. In its iPhone implementation, ‘pageflow’ encourages rapid browsing of the whole magazine. Here is a still shot of the coverflow feature (comparable to the coverflow with which iTunes users survey their CDs). Pageflow is a crucial step through which digital magazines can benefit from the quality and the design values of the print magazine. Pageflow in action gives the digital reader the quality, the artwork, and the design built in to print magazines. Magazine publishers have for too long worked on the assumption that it is their task to adapt the magazine to the web by ‘repurposing’ its content and its design values. Nonsense. The web, or at least an iPhone rendition of the magazine, gives the publication its full visual quality. Perhaps even better than in print (though I would rather be judged on this claim once Apple has produced its new Tablet device. The 10″ tablet with a digital magazine will be more sumptuous than many printed versions). Finally, the key point about a magazine App is that it is for sale. This is commerce: the iPhone is a way of selling subcriptions which simply are the whole magazine and as much of its archive as the publisher cares to offer to iPhone subscribers. Athletics Weekly offers subscribers access to over 100 back issues, which makes the weekly subscription price, of £1.19 amazingly good value. From the magazine publishers point of view, the key thing about a branded iPhone App is that this is a way of selling magazine subscriptions. Athletics weekly is now being offered through weekly or monthly subscriptions and readers are buying subscriptions and making in-App purchases for renewed subscriptions. The Apple iPhone App-ecology is working. This is some really good news for the magazine industry. Sell subscriptions to iPhone users and iTouch users. There will soon be over 50 million such digital customers waiting for their magazine subscriptions. The sad truth is that much of the magazine industry is so stunned by the way that advertising revenues have collapsed that business strategists are finding it hard to think about anything else, about anything positive. But the community of iPhone users is a huge market to which magazine publishers should be selling subscriptions. It is amazing how slow the industry has been to see and to seize this potential. We know of no magazine which currently makes itself commercially available in its entirety through the iPhone App store. 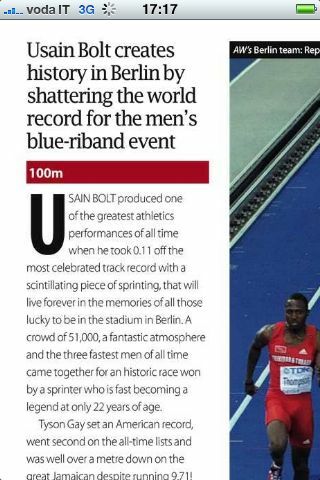 Athletics Weekly is the first magazine to show how it can be done, and it came through Apple’s unpredictable approval process in the very week in which Usain Bolt showed us that 100 metres can be run at lightning speed. Some of our biggest and best magazines are slow off the mark! 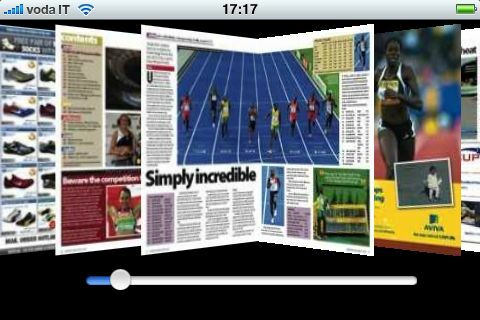 We have a short video which provides a brief overview of the way this App technology can work for a magazine. Note the way that telephone numbers become call-able off the page. There can be no doubt this is the way that magazines should behave on an iPhone. All phone numbers should be callable from digital editions that work on phones. This is another big step for the industry, and one that has key potential in reviving those advertising budgets.